Urusei Yatsura is a comedic manga series written and illustrated by legendary mangaka (creator), Rumiko Takahashi. It was her first ongoing manga series and was serialized in Weekly Shōnen Sunday from 1978 to 1987. Urusei Yatsura is comprised of 374 individual chapters, which were collected in 34 tankōbon (graphic novel or trade paperback) volumes. Urusei Yatsura (which means “obnoxious people”) is the story of a Japanese high school boy, Ataru, and an ogre-alien princess, Lum. VIZ Media published Urusei Yatsura in English during the 1990s in various formats. In 2018, VIZ announced that it had re-licensed the manga and that it would publish it in its 2-in-1 mini-omnibus editions that collect two graphic novels or tankōbon volumes in one paperback volume. The Urusei Yatsura Signature Edition is being published under the VIZ Signature imprint with a rating of “‘T+’ for Older Teens.” Volume 1 carries a print MSRP of $19.99 U.S. / $26.99 CAN, and future volumes will present 400 pages of content in the larger “VIZ Signature” trim size, with the complete series scheduled for English publication by VIZ Media on a quarterly basis. 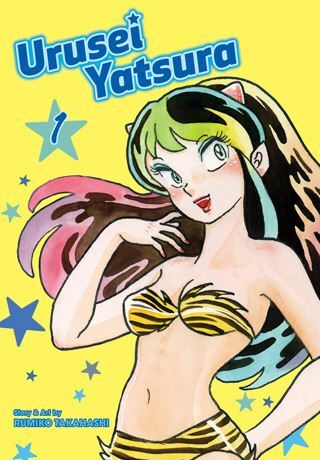 Urusei Yatsura (Signature Edition), Vol. 1 (Chapters 1 to 17) introduces Ataru Moroboshi, a lecherous, lazy, always hungry, and girl-crazy high school boy. He is randomly chosen by an alien computer to battle for the salvation of Earth. That is how he meets Lum, the alien slash ogre princess. Lum starts to insists that she is Ataru's wife after he accidentally proposes to her. Ataru considers Lum a pest and a needless complication in his life. His real girlfriend, Shinobu, is furious at Ataru for putting himself in this position. Now, Ataru finds himself fending off Lum, trying to appease Shinobu, and constantly in conflict with all manner of alien beings and also figures from Japanese mythology. THE LOWDOWN: I first learned of Urusei Yatsura as an anime because I read (where, I don't remember) that it had influenced film director Chris Columbus (who directed the first two Harry Potter films) when he created the cult Saturday morning animated TV series, “Galaxy High” (1986). Years later, I was able to buy a few episodes of the anime on VHS and also purchase a few issues of VIZ's publication of Urusei Yatsura as an American monthly comic book series. Urusei Yatsura Signature Edition Graphic Novel Volume 1, which collects the first seventeen chapters of the original manga, is the first time that I have been able to read a substantial portion of Urusei Yatsura. The thing that surprised me the most about this first volume is how well-developed the humor is despite the fact that this was Rumiko Takahashi's first ongoing series. I have always admired how Takahashi can make a single chapter in a serial manga seem like a self-contained episode that is able to be a complete story by itself outside the main narrative. Thus, each chapter is a comic work, and one of the best things about Urusei Yatsura is that each volume seems like a collection of sitcom episodes. Another element that I enjoy is how Takahashi uses creatures and beings from Japanese folklore and mythology, often known as yokai. Takahashi delights in the first volume with an colorful menagerie of princesses of various mythological types, including a crow goblin princess, a snow goddess, and even a kappa princess who has a jealous, giant-sized boyfriend. After decades of expectations on my part, I find that Urusei Yatsura lives up to the hype. I thoroughly enjoyed it, and I heartily recommend this debut volume, which is worth the $19.99 (U.S.) cover price. I READS YOU RECOMMENDS: Fans of Rumiko Takahashi will have to have the “VIZ Signature” edition of Urusei Yatsura.